April | 2010 | Chuc Chimes In: Today's latest tips to make your minutes count! A life lesson experience that brings a sense of awe. In my opinion, these are not just Grand Canyon considerations, these are life lessons too. I’m not a travel guide, but I do want you to know that If you ever hike in The Grand Canyon, you will quickly notice that — no matter what trail you are on — there are ongoing new sights to see, new ideas you’ve never had before, creative thoughts filling your head, the desire to explore and experience more and more, and an unbelievable sense of exhilaration. You will see people smiling and people helping each other, and you will begin to notice how important it is to pace yourself. Disagree with me if you want, but I think you can see the face of God in The Grand Canyon. If you don’t see That, you certainly become filled with a sense of awe about the creation you are exploring and the adventure you are having when enjoying — and experiencing — the creation itself. Does this make sense to you? Please leave your comments here. 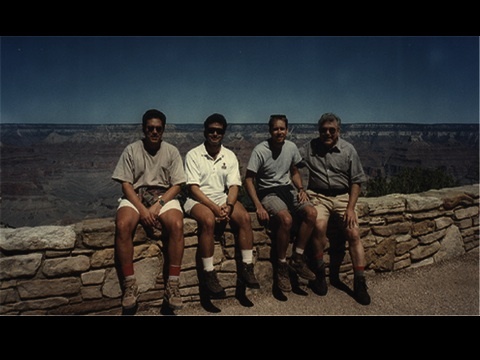 In 1996 my three sons (Brett, Todd, Scott) and I were hiking down Bright Angel Trail on our way to the bottom of the Grand Canyon. We had hiked at the The Grand Canyon before and, thus, we knew how enjoyable it can be when we take our time, look at the beautiful surroundings, and savor each majestic step. We had just started down the trail when four men and women hurried past us. They were practically racing and, while skipping down the trail, they were singing Broadway Show tunes as loud as possible. When the four people rushed past us, my sons and I smiled at each other because we could see that the four people who were hurrying and singing were using a lot of energy as they went bounding down the trail. My sons and I soon forgot about the people who passed us so quickly. We took our time enjoying the beautiful views of rock formations called Brahma Temple and Cheops Pyramid before we reached Indian Gardens which is almost half way down the trail to the bottom of the canyon. We stopped and relaxed at Indian Gardens which is almost like an oasis in the middle of the desert because it’s surrounded by ancient cottonwood trees that enable you get out of the bright sunshine to relax, enjoy, and appreciate. We liked Indian Gardens so much that we decided to switch trails and to follow the Plateau Point Trail in order to get a different view of the Colorado River than we had seen before. And — wow! — what a great view of the winding Colorado River from Plateau Point. We loved it there and then returned to Indian Gardens. When we were relaxing at Indian Gardens the second time, we noticed the same hurrying-singing people who had passed us hours before. This time they were struggling, agonizing, and slowly creeping up the mountain. We noticed that when they took each step, they complained to each other, saying how much their muscles hurt and how they were so worn out they could hardly breathe. One of the people who had been singing loudly on the way down the trail said he didn’t think he could possibly make it back up the trail to the rim. My son, Todd, loves to joke and he turned to his brothers and me and said, “Well, they sure aren’t singing ‘She’ll Be Coming Around the Mountain'” and we all laughed to ourselves. I’m not reporting this experience in order to make fun of the people who had been racing down the trail and who now were struggling and complaining. No way. Instead, I’m describing this situation because it reminds me (and I hope it reminds you too) to recognize that hurrying prevents us from enjoying and appreciating the experiences that are around us. It also reminds me (and I hope it reminds you) of how important it is to change pace and make adjustments for each of the different business and personal experiences we encounter.